In order to understand and treat the developmental, behavioral, and relationship needs of the child, clinicians and providers must focus on the parent-child relationship. Early childhood mental health intervention requires working with parents and young children together in a way that helps attend to the needs of both–together and separately. Research from early brain development, attachment, and childhood trauma supports the need for clinicians to develop areas of expertise to ensure that those working with young children and their families are well-trained to promote optimal mental health and address behavioral health concerns. This webinar will focus on skills and competencies providers need when working with parents and young children and strategies for supporting healthy social-emotional development. 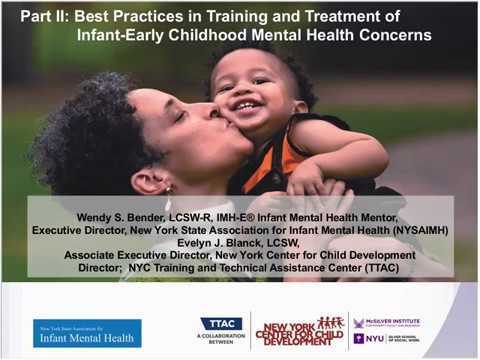 Attendees will be introduced to the NYS-AIMH Endorsement®, a credentialing system that supports and recognizes professionals who apply infant & early childhood mental health principles to their practice. Endorsement® is not a license but an overlay that complements one’s professional license and/or other credentials.